As a heating, air conditioning, and refrigeration (HVACR) technician, you will be the one who installs, maintains, and repairs these systems that control the temperature, humidity and general air quality in the buildings in which we live, work, and play. HVACR systems consist of many mechanical, electrical, and electronic components such as motors, compressors, pumps, fans, ducts, pipes, thermostats, and switches. Technicians must be able to maintain, diagnose, and correct problems throughout the entire system by adjusting system controls and testing the system's performance with special tools and equipment. 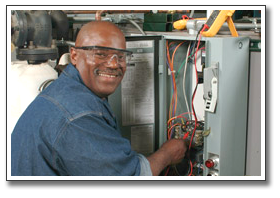 As a UA HVACR Technician, you become part of an elite workforce - a workforce that promises to be the safest, most productive and highly trained in the industry. And, we can back up those promises with proof!